Bamboo is notorious for invading and overrunning backyard gardens with its aggressive underground rhizomes (roots). In Stanley Park, the bamboo’s wandering ways have been confined to two small islands in Lost Lagoon. Making the most of this limited real estate, however, the bamboo has grown into an impenetrable thicket blanketing each island and blocking out wildlife. For years the islands, originally built as habitat for ducks and geese, have sat empty. 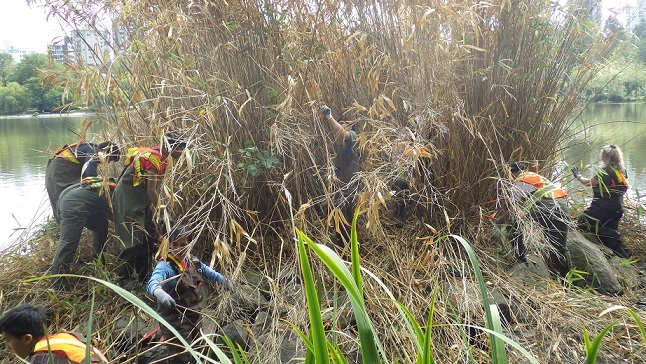 HSBC employees tackle a bamboo thicket on a small Lost Lagoon island. Cut to this past August when HSBC employees donned their super hero capes – and hip waders – to restore habitat to one of the islands on the northern edge of Lost Lagoon. In just three hours, this enthusiastic threshing crew of 24 removed over half the bamboo. They are slated to return this fall to finish the job. Once the bamboo is cut, its rhizomes will be dug up and native plants will be restored to the site creating suitable habitat for the wildlife of Lost Lagoon. Bamboo piles up beside Lost Lagoon as HSBC employees clear it from a nearby island to create habitat for wildlife. 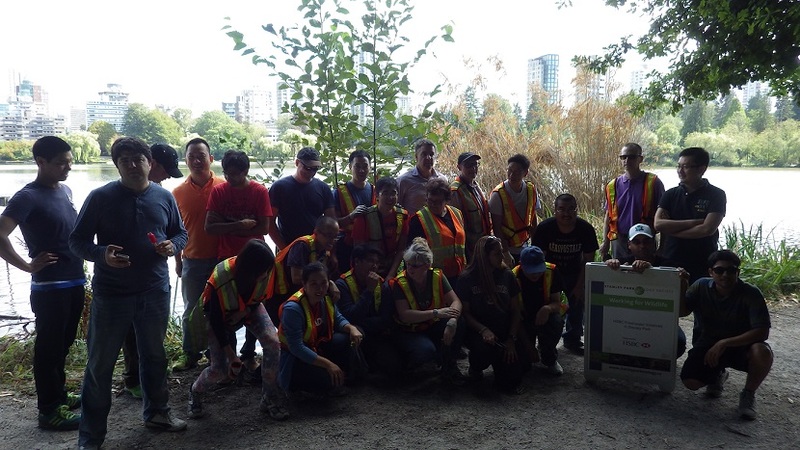 HSBC Bank Canada is the Title Supporter of the HSBC Freshwater Initiatives in Stanley Park project. 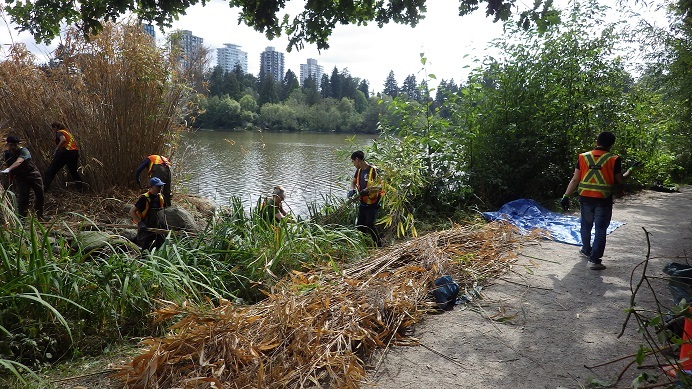 The project includes habitat restoration in riparian zones through invasive species removal and native plant re-introduction, as well as water quality sampling, aquatic wildlife surveys, and installation of nest boxes to benefit species of significance in Stanley Park. The HSBC team recovers from a half day of bamboo battle.